At the entrance to the Mahane Yehuda market on Friday mornings there’s a smell of baking in the air, and it’s hard to think of anything more magical or more intoxicating. Customers rushing to buy a challah for Friday night dinner, and some can’t resist picking up a small one to nosh on it while shopping. Although delicious aromas are in the air from early morning, the actual work of baking starts around the middle of Thursday night – as on every weekday night. That’s when bakers near the market and throughout the city begin to knead the dough, let it rise, and create their tender, fragrant miracles. 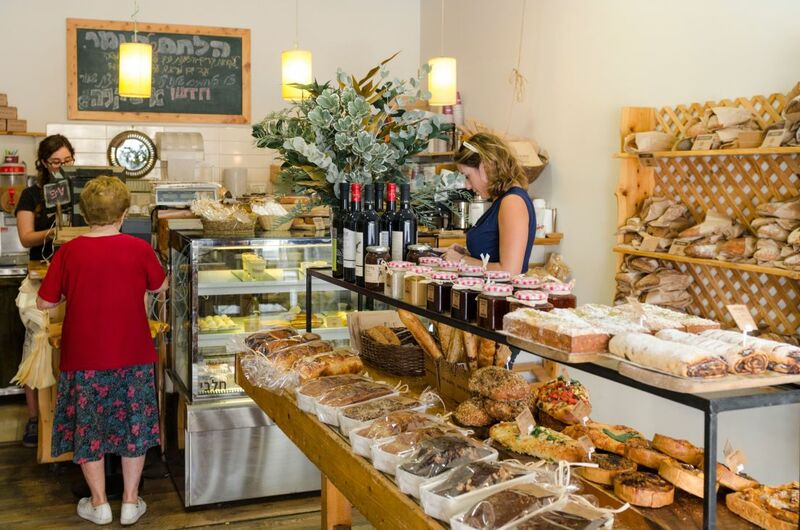 Following are a selection of Jerusalem’s not-to-be-missed bakeries. 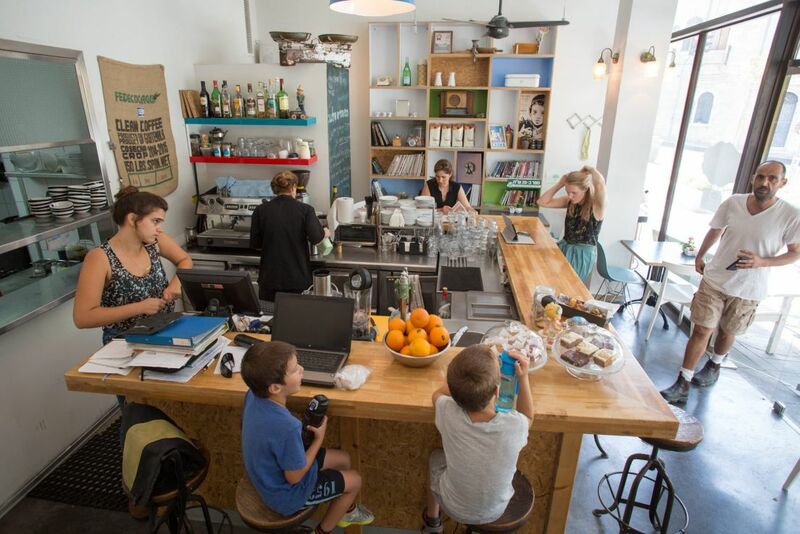 At 74 Agripas Street you’ll find the Teller Bakery, whose reputation has reached beyond Israel’s borders – even former U.S. President Barack Obama tasted their baked goods and was hooked. This is an upscale bakery whose hand-made breads and pastries can be found in many hotels and restaurants in Jerusalem and throughout the country. Every day they bake dozens of types of bread, rolls, cakes and cookies, which can be purchased at the bakery or at a stall in the Mahane Yehuda market. Most of the breads and baked goods are based on sourdough, considered more healthful and more natural. There’s rye, spelt and multi-grain breads, baguettes, bread with tomatoes or olives, focaccia, ciabatta, half whole wheat and half white. There is challah for Shabbat of course, and the highlight is blueberry and nut bread. Addicts claim that the sweet offerings, such as almond croissants and halvah pastries – are worth every bite and every calorie. Challah challenge: At Teller, you will find classic challah, braided and airy, made from white flour, at 13 shekels, whole wheat challah at 15 shekels, and white challah with raisins at 14 shekels. There are also individual challahs (2 shekels for those made with white flour and 2.5 for whole wheat). Challahs are sold on Fridays and holiday eves until 1 P.M.
Take note: In the morning they sell great sandwiches, and every day at about 6:45 P.M. leftover loaves are sold at half price, to everyone’s delight. 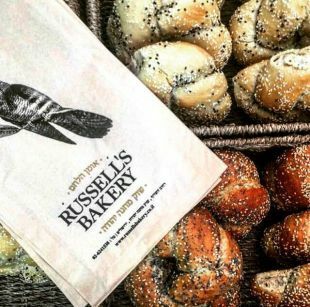 At 2 Hadekel Street, right outside the Mahane Yehuda market complex, is Russell’s Bakery. The store itself is inside the market, and the high-quality baked goods are on sale at both locations. The owner, Russell Sacks, originally from South Africa, relates to baking as an art form. The unique aspect of the bakery, aside from the use of natural ingredients (for example, country flour enriched with nutritious fibers, filtered water only, natural and unprocessed salt) is the work method. The breads are prepared in the French style, which means that the dough is placed in bamboo baskets so it will rise slowly and at its own pace. The bread is baked every morning in a stone oven, and from there the loaves are distributed to the bakery store and to restaurants and hotels in the capital. There is olive and rosemary bread, and breads made from wheat, grains, sunflower seeds, sourdough, spelt, flax, nuts and more. 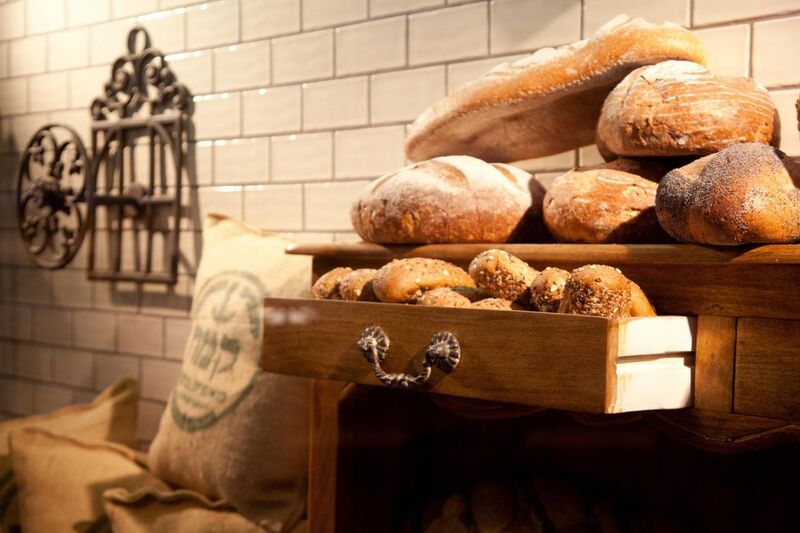 In a special section there are baguettes baked in the shape of a sheaf of wheat, with a crisp crust, and Basher bread baked with whole wheat and rye flours especially for the Basher cheese store in the market. Challah challenge: On Fridays you can find challah made with white flour sprinkled with sesame seeds (13 shekels), whole wheat challah (15 shekels) and Swiss challah rolls from white flour with raisins (5 shekels). Take note: Starting at 6 P.M. the breads are sold at a 50 percent discount. This local business has been operating since 1875, a date that is almost inconceivable in Israeli terms, but Berman’s Bakery was established that year in Jerusalem and today is among the biggest in Israel. In contrast to small boutique bakeries, where everything is done by hand, at Berman’s they are proud of their automated equipment, which produces about 3,000 loaves of bread an hour without being touched by human hands at any stage. The branch on Agripas Street next to the market offers a pleasant experience to anyone who loves baked goods, and the well-lit store has a café too, because there’s nothing like coffee with a pastry. Tomer Ballas is both an artist and a gifted baker, so that every loaf is an original work of art. He still calls his bakery a studio. At the start of his career he sold to restaurants and delicatessens, and when demand grew he established a small plant in Talpiot, and later four stores in Jerusalem and another two in Modi’in. All the stores are located in small family-oriented commercial centers rather than in malls, and Ballas once said that Prime Minister Benjamin Netanyahu used to buy fresh bread every day at the branch on Jerusalem’s Gaza Street. Today the chain employs dozens of workers and bakers, but the traditional methods are meticulously preserved: The bread is completely natural, without preservatives, baking enhancers, stabilizers or yeast; everything is based on sourdough, flour, water and salt. Fridays are the busiest days, when they braid all the challahs and challah rolls without a single machine. You’ll discover an original variety of breads and baked goods that are rarely found in other bakeries, thanks to Ballas’ daring and adventurous nature. There’s French country bread; nut bread; bread made from natural whole wheat flour plus sourdough, and coated with a crackling mixture of sunflower, pumpkin and sesame seeds and katzah (nigella). There is Tomer Kol Tuv bread (with reduced calories) made from whole wheat and rye, along with sourdough, bran, oats, quinoa, flax, millet, spelt and salt; rye bread made with beer and cranberries; Russian rye bread, bread with Tassos olives, bread with fresh tomatoes and basil; date and quinoa bread and many more. Challah challenge: Ballas makes classic challah from white flour, olive oil and eggs; country challah made from a combination of whole wheat, white and corn flour; raisin challah with a little honey, and a brioche challah with a butter-based dairy dough (17-19 shekels for a regular challah, 2.5 to 4 shekels for a small individual challah). There is also a rich menu of sandwiches; baked goods such as croissants filled with goat cheese; and quiche. You can pile up whatever you like on a tray to eat on the spot or take with you. Baker and pastry chef (as well as blogger and Instagram mainstay) Naama Gaon visits the Shraga Café at 3 Yannai Street every Friday to offer all her baked goods: burekas, sandwiches on fine breads, yeast cakes and of course original challahs that you won’t find anywhere else. If you choose “A breakfast Naama really likes” you’ll get butter burekas filled with goat cheese and a sunny-side-up egg along with a small salad, tahini and zhug (a Yemenite spice); or a vegan-vegetarian sandwich with cashew cheese, pesto, black olives and a variety of garden vegetables; a sandwich with patties made from orange-colored vegetables, lemon tahini, a pesto of coriander and rocket leaves, and more. But in contrast to most sandwiches, in which the filling is the most important part, here the bread is just as significant, because it’s a work of baking art – a sourdough ciabatta or a whole wheat roll. The challah challenge: It’s well worth lingering over Naama’s challahs, because they’re really terrific. There’s zhug challah, smoked Korean challah, challah enhanced with smoked paprika, thyme and black pepper, squash and sage; these are only some of the changing variety on sale every Friday from 8 A.M. until they run out (18-30 shekels, depending on the size. Also on offer are individual yeast cakes such as cinnamon rolls, almond and raspberry pastries and more, for 22 shekels. And Gaon promises new surprises every Friday. Persian origins: The Nehama Bakery started out in Jerusalem’s Bukharan neighborhood way back in the 1920s. It’s a Persian bakery that at first produced only Persian pitas and dry Persian flatbread based on the grandfather’s traditional recipes. The recipes were passed on from father to son, and the Persian baked goods still occupy a place of honor, although the variety of products has expanded. Now there are mini pretzels, whole wheat breads, baguettes, rye breads, quiches, pies, yeast cakes, muffins, burekas, croissants, strudels and more, most of them produced in a stone oven. The six branches in Jerusalem include a big store in Talpiot, a store in the ultra-Orthodox Beit Yisrael neighborhood and on Kikar Hashabbat. Something sweet: At the top of Agripas Street is the Marzipan Bakery, which some say has the best chocolate rugelach (a filled, rolled-up pastry) in town. They also sell cream and yeast cakes, cream puffs filled with crème patissiere, burekas, regular challahs (including heart-shaped ones) and whole wheat challahs, good coffee and more. Hot specialties: In 2003 the branch of Mifgash Hasheikh on Hauman Street opened and became a pilgrimage site for partygoers. From there the chain expanded to Jerusalem and even outside the city. Fans love the sahlab (a Middle Eastern pudding) in the winter and lots of hot baked goods with their own special names, like the sambusak pastry with melted cheese and mushrooms called “igul” (circle). There are also pastries with yellow cheese and pizza sauce, called “meshulash’’ (triangle); a Bulgarian cheese pastry called, unsurprisingly, “sambusak”; a pastry with Bulgarian and yellow cheese called “sheikh”; a pastry with Bulgarian cheese, olives, za’atar and olive oil called “Billy”; or a pastry with Bulgarian cheese, mushrooms, za’atar and olive oil that everyone calls “Yossi.” The place offers other baked goods, such as croissants, rugelach, schnecken (sweet buns), breads, challahs, pizza and even malabi (a milk-based pudding). 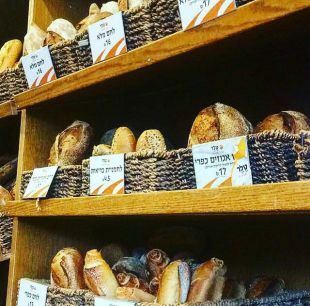 A Jerusalem institution: It started small, but now the Neeman Bakery has spread throughout the country. It all began in 1944, when the grandfather, Rabbi Baruch Neeman, began to prepare his own baked goods and sell them from a baby carriage in the Bukharan neighborhood and other parts of the city. Today the chain has about 40 branches in Israel and is proud of its new factory, equipped with state-of-the-art automation. In Jerusalem the chain has a large number of branches, including in the Jewish Quarter of the Old City, on Jaffa Street, Davidka Square, Talpiot, King George Street and the Central Bus Station. Among its many products are sourdough breads, parve cakes and cakes based on sweet cream, mousses, pies, various types of burekas and croissants, Italian baked goods such as pizza and calzone, and focaccia and challah.